We understand that sometimes schedule adjustments are necessary. We request that you cancel or reschedule your reserved appointment with 24 hours notice for weekday appointments and 48 hours notice for weekend appointments. 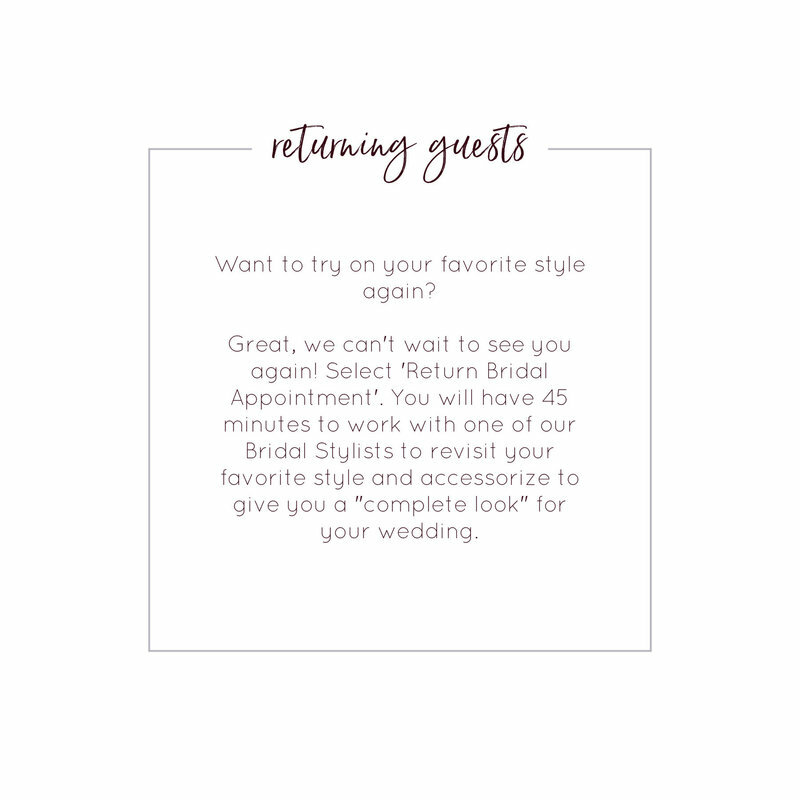 Short-notice cancellations or “no show” appointments take away another bride’s opportunity to find her dress with us. We reserve the right to ask for a credit card guarantee for your appointment. What to expect on your first appointment! Pre-Shop, I'm just getting started! I'm coming back to say yes! I'm ready to find my dress! You will have an hour to work with one of our bridal stylists in your own dressing room and seating area for your guests. You may bring up to 3 guests in an appointment. 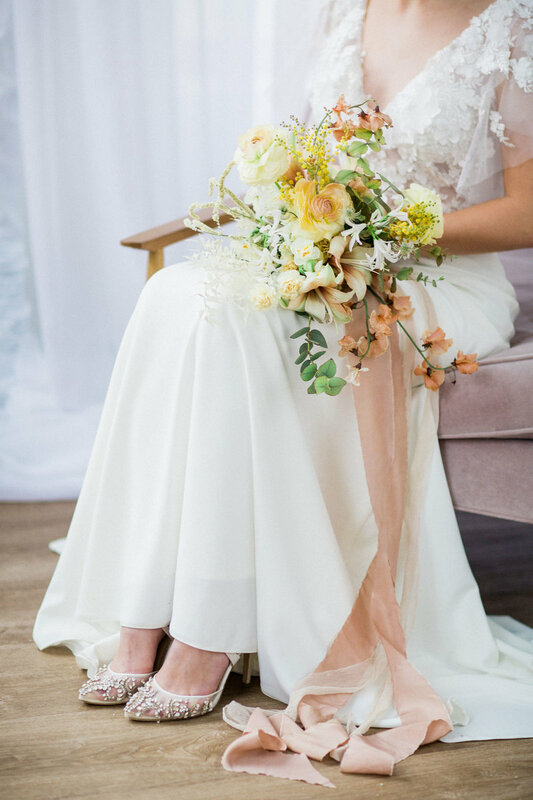 On Sundays we do things a little different (recommended for brides who may have narrowed down style or want a fully guided, streamlined process). You will have 60 minutes to work with one of our bridal stylists in your own dressing room and seating area for you guests, we have a limit of 3 guests in an appointment. Great, we can't wait to see you again! You will have 45 minutes to work with one of our bridal stylists to revisit and accessorize your favorite dress for a "complete look". You may bring up to 3 guests in an appointment. 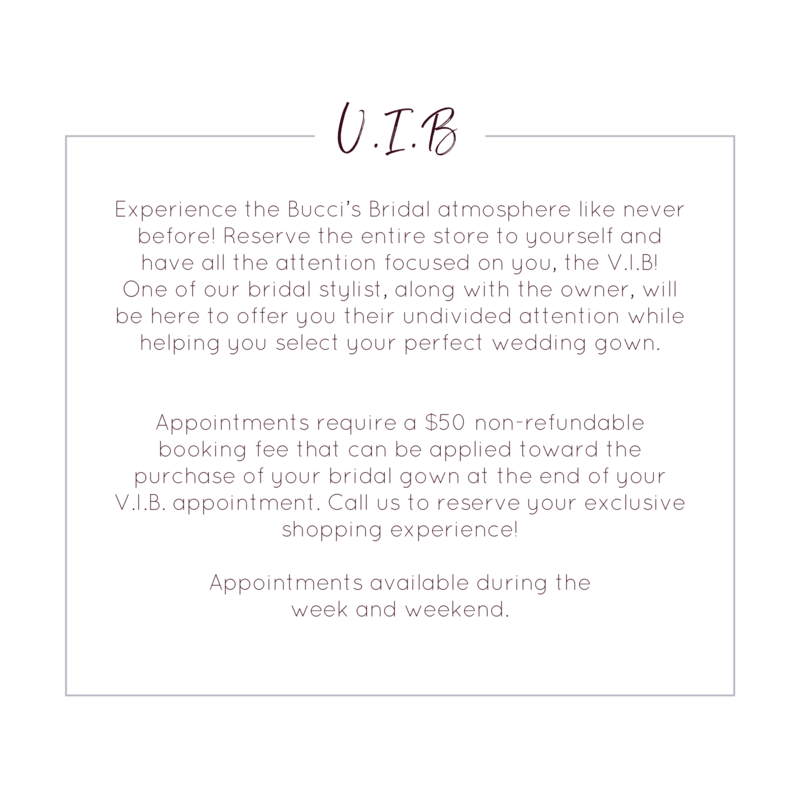 Experience the Bucci's Bridal atmosphere like never before! Reserve the entire store to yourself and have all the attention focused on you, "Very Important Bride"! One of our bridal stylists will be here to offer you their undivided attention while helping you select your perfect wedding dress. This appointment is designed for brides looking for guidance on how to begin selecting their perfect wedding dress style, or for brides wanting to preview our selection before their scheduled bridal appointment. You will have 30 minutes to consult with one of our bridal stylists, receive a guided tour, and try on your first 3 wedding dresses. You may only bring 1 guest to accompany you for this pre-shopping appointment. *This appointment does not guarantee a fitting room, if both fitting rooms have been reserved for bridal appointments. Which appointment should you book?